After traveling 200 thousand kilometers, the international team of the World March arrived today, January 2, at the Park of Study and Reflection Punta de Vacas in Argentina. 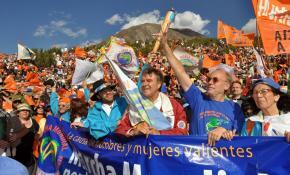 Close to 20,000 people heard the representatives of the World March from Chile, Argentina, India, Italy, the Philippines, Spain and England that circled the globe calling for nuclear disarmament. 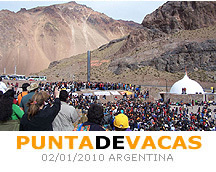 The final destination of the World March for Peace and Nonviolence was the Park of Study and Reflection Punta de Vacas, located in the mountains on the border between Chile and Argentina. This first World March has been “the largest manifestation for the Peace and Nonviolence in history and the first at a planetary scale,” according to its coordinators. Those gathered for the event heard from the activists who have traveled the globe spreading the March`s message. At 18 hours Rafael de la Rubia, the international spokesperson for the initiative, began his testimony: “This March is a demonstration effect, building upon other great transformative actions of humanity.” The event was held in the same place where the March was launched in November 2008, in the Symposium of the World Center of Humanist Studies. Hundreds of thousands of people have participated in the march, as have more than three thousand organizations and a group of almost 100 marchers, forming different base teams that carried out four distinct routes: intercontinental, Middle East, the Balkans, and Southeast Africa. In their trajectory they passed through more than 400 cities in 90 countries and have traveled close to 200 thousand kilometers during 93 days. In their journey through these countries, the marchers have been received by the Secretary-General of the UN, Ban Ki-Moon, by Nobel Peace Prize Laureates, national presidents, parliamentarians, and hundreds of mayors. But the reception has also been popular; two examples were the 80,000 youth who greeted the international base team in a concert in Chile and 12,000 school children in the Philippines who formed a giant peace sign, among many other massive events. Regarding the daily lives of the marchers, the accommodations were at times comfortable but other times austere: the marchers slept in Buddhist monasteries, makeshift homes, and even in a fallout shelter. There were threats of a tsunami, earthquakes, and typhoons, and they marched in temperatures ranging from 40 degrees to below zero. During the tour, they encountered people made homeless by typhoons in the Philippines, Hibakushas, or survivors of the Hiroshima bomb, and millions of families torn apart by wars in Korea and Palestine. They visited memorials to the millions who died in wars in Europe and Asia, places where torture is still being carried out, and witnessed the border conflicts between India and Pakistan, Israel and Palestine, within the Balkans, and in Tijuana, at the border between the United States and Mexico. They saw children working in Asia, Africa and America, and battered women worldwide. "On the journey, everything has happened to us, including moments of great meaning, where the demands of the past converged with the aspirations of the future. Moments of a connection with the people that allowed us to communicate with them, surpassing languages, cultures, races and beliefs," said de la Rubia, who is also coordinator of the international association World Without Wars and Without Violence, the convener of the march. Bhairavi Sagar, from India, who traveled with the team through Europe, Africa and the Americas, explained in her testimony “Being born in the country of the Father of Nonviolence - Mahatma Gandhi – a man, who dedicated his life so that our country achieved freedom and because of whom I am standing here today as a free unchained human being. Now, it is my turn to give now to the future generations – to put in my bit to leave a world worth living for them in dignity and happiness”. Tony Robinson from the UK who traveled through 30 countries spoke from the heart and said “in Japan we met the Hibakushas, the survivors of the atomic bomb. One of them said to us: Thank you, thank you. This is so important!” I was translating her words while I was trying not to break into tears because of the strong empathy I felt with the terrible suffering that this woman had lived through and with the feeling of not being worthy of her gratitude. The speeches went on and Giorgio Schultze, European spokesperson of the World March and member of the Middle East and the Balkans teams, said: “We crossed the wall that divides Israel from Palestine and now more than 200 social leaders, veterans of Al Fatah, are asking us to help them build a nonviolent army that might communicate and open the doors towards reconciliation and start a new history of peaceful coexistence between Palestinians and Jews”. The event finished with the words of Tomas Hirsch, Latin-American spokesperson of the World March, who mainly spoke about the future of the Humanist Movement, the organization that propelled the World March. Shortly after 7:30 pm, when the sun had slipped behind the mountains of the Andes Range, the event finished with the greeting of “Peace, Force and Joy” of all those present.